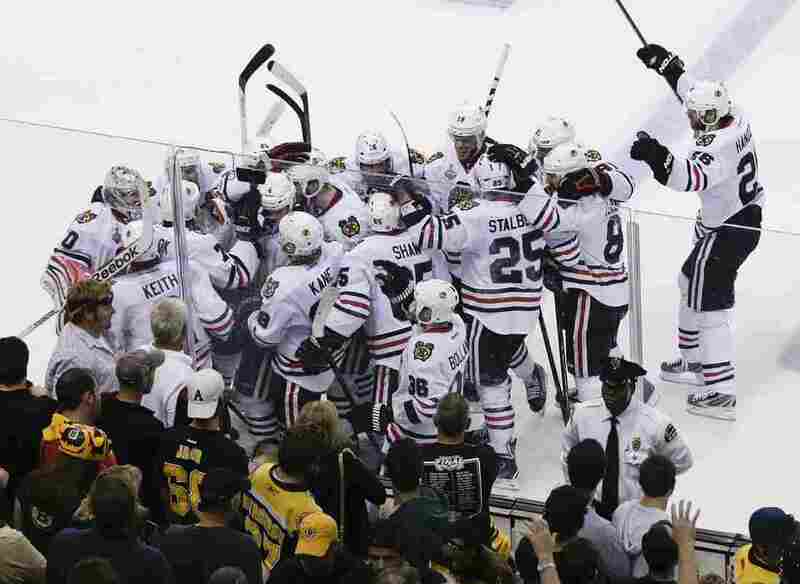 Chicago Defeats Boston, Evens NHL Stanley Cup Series : The Two-Way It took another overtime, but the Chicago Blackhawks defeated the seemingly unstoppable Boston Bruins 6-5 to tie up the Stanley Cup championship. The Chicago Blackhawks mob Brent Seabrook after his game-winning goal against the Boston Bruins in overtime of the NHL hockey Stanley Cup Finals on Wednesday night in Boston. So there was another overtime last night in the Stanley Cup series, except this time the Chicago Blackhawks outlasted the Boston Bruins, defeating them 6-5 and tying the NHL championship series. What happened to the formidable Bruins? Well, lots of things, says ESPN, but start with this: "The impenetrable goaltender who hadn't let one past him in the TD Garden for a stunning 193 minutes, 16 seconds finally gave up a goal — then another, and another, and another and another and another." Famed Bruins goalie Tuukka Rask apparently had an off night — going from a shutout against the hapless Blackhawks in Game 3 Monday to last night's loss. He faced an energized Chicago offense from a group of guys who've been, well, a bit listless recently, until turning things around last night. The Blackhawks' web site says that "Chicago twice led by two goals before Boston drew even in the third period, then led 5-4 with less than eight minutes remaining in regulation before the Bruins scored to force overtime. There were wild sequences that led to highlight-reel saves, fluky bounces that led to goals — and everything in between." One change that worked powerfully in Chicago's favor was a decision by Hawks coach Joel Quenneville to put captain Jonathan Toews on the same line as wingers Patrick Kane and Bryan Bickell, notes the Boston Globe. Toews hasn't scored a goal since Game 5 of Blackhawks' series against the Detroit Red Wings. Last night, he sank a goal in the second period, followed two minutes later by Kane. "I like that line," Quenneville told the Globe. "They seem to have some chemistry. Scoring certainly helps. Everybody on that line brings something different to the party. Bicks, off the rush, can shoot. Kaner has possession. Jonny gets through." Winger and high scorer Marian Hossa, unexpectedly scratched from Monday night's game with an undisclosed injury, returned to the Chicago lineup. He had 19 minutes of ice time, an assist and four shots on goal, USA Today says. For all of Chicago's strength, Boston didn't creep quietly into the night, with two goals from the solid Patrice Bergeron and more from Milan Lucic, Johnny Boychuk and Rich Peverley, according to the Boston Herald. It might even have gone Boston's way in overtime, Bleacher Report notes. But Chicago goalie Corey Crawford executed a big save, setting up Chicago's next big play as defenseman Brent Seabrook blasted a puck past Boston's Rask, winning the game and tying up the Stanley Cup series. "There was a lot of our game tonight that was just average," Bruins coach Claude Julien told ESPN, "and average isn't good enough at this stage of the season." Game 5 is Saturday night in Chicago, and will again be available on NBC at 8 PM ET.